A Chinese Medicine Class: You are a part of this universe. Prof. Yang is from Kunming in Yunnan Province, Southwest China. Kunming has one of the mildest climates in China. That’s why it is called “Spring Castle.” My town, Nagoya is incredibly humid and hot in summer and very cold in winter. So, I assumed he is having a tough time here, but he isn’t. He is a Chinese doctor. He has a broad knowledge for surviving harsh weather conditions. There is an idea of “Tao follows nature” in China. That is, it is essential for living healthily and longer to follow nature. From the point of view of Taoism, today’s Japanese diet seems to be crazy. There are a lot of out of season vegetables and fruits which were grown with a large amount of pesticide, meat of animals which were given antibiotics, and many products with added artificial preservative in grocery stores. Japanese people rely on this kind of food industry. Prof. Yang mentioned five key words for healthy eating manner: warm, mild, soft, little, slowly. That is, you should eat a small amount of warm, soft and mild tasting food slowly at each meal. If you have something hard, you should chew it well until it becomes soft. This eating manner is good for your digestive system. On the one hand, in Western medicine, doctors start medical therapy on people after they catch diseases; on the other hand, in Eastern medicine, doctors start treatment before people catch diseases. If you are not in good condition, such as having a headache, stiff shoulders, back problem, or dizziness, and go to see the Western doctor, most of you will be told, “I don’t see any problems. Let’s see how it goes.” But Eastern doctors will regard those symptoms as signals that your internal organs are not working well and start to treat you earnestly. They believe that it is too late to treat patients after they are sick. China has the yin-yang principle. Heaven is yang, and the earth is yin. Human-beings take the air from heaven and food from the earth. 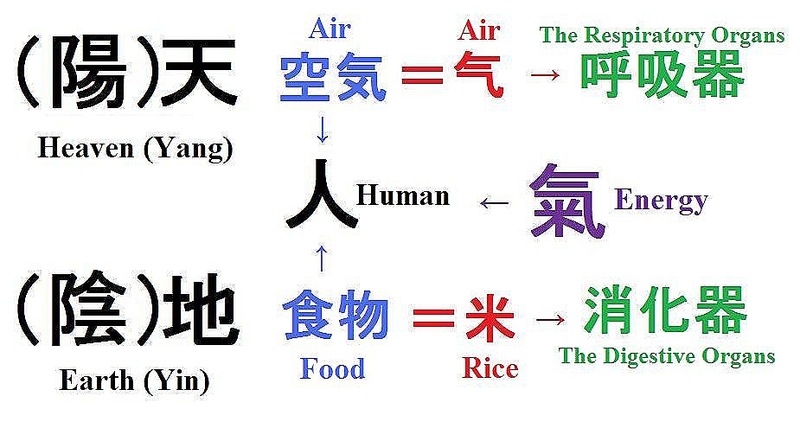 The Chinese character, which means energy, is made up of the symbols for ‘air’ and ‘rice’, the latter representing food. That is, you get energy from the air and food, and you become healthy with your respiratory and digestive systems working well. You are a part of this universe. You cannot be healthy if you forget about it and ignore natural laws. As I told you above, it is very humid and hot in summer in Nagoya. The temperature is over 30 degrees every day. So, people tend to have something cold. But inside the buildings and trains are air-conditioned, and it is sometimes very cold. It means that you make yourself cold both inside and outside. It is bad for your digestive system. If your digestive and absorptive function does not work well, your immune system will weaken. This problem is not only in the summer. It will affect your condition until next spring. That is why you should eat wisely to become or stay healthy. You should eat something warm and avoid cold drinks in summer! Ah, beer and ice cream are calling me from the refrigerator…What shall I do? 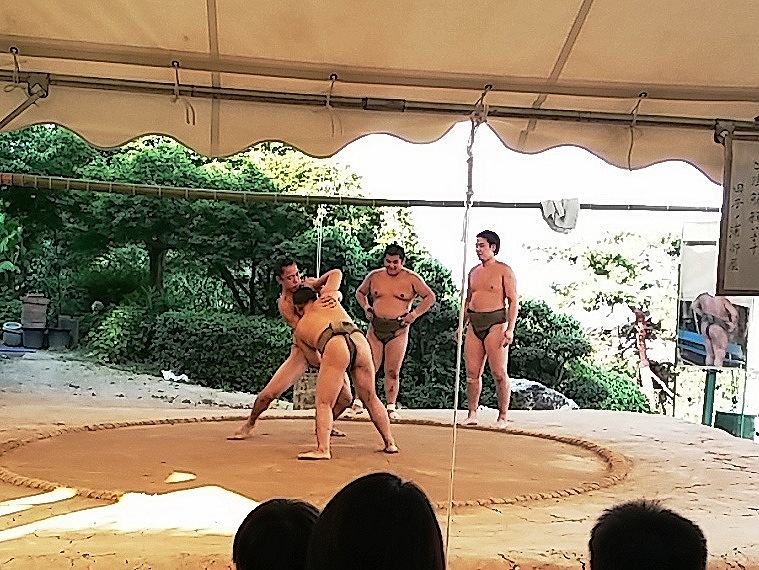 “You should have done it that way from the beginning…” murmured Sakanabe, a sumo wrestler. 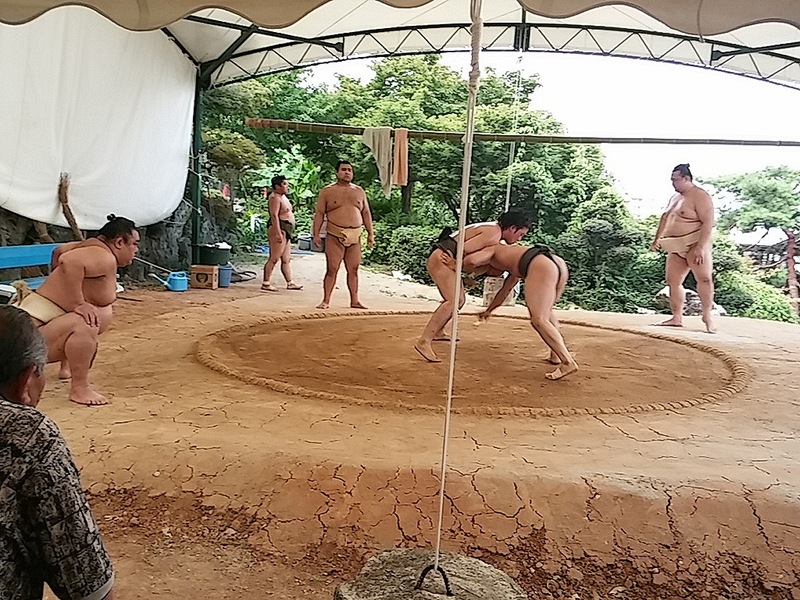 I was observing an early-morning practice of sumo in Nagakute on July 26. 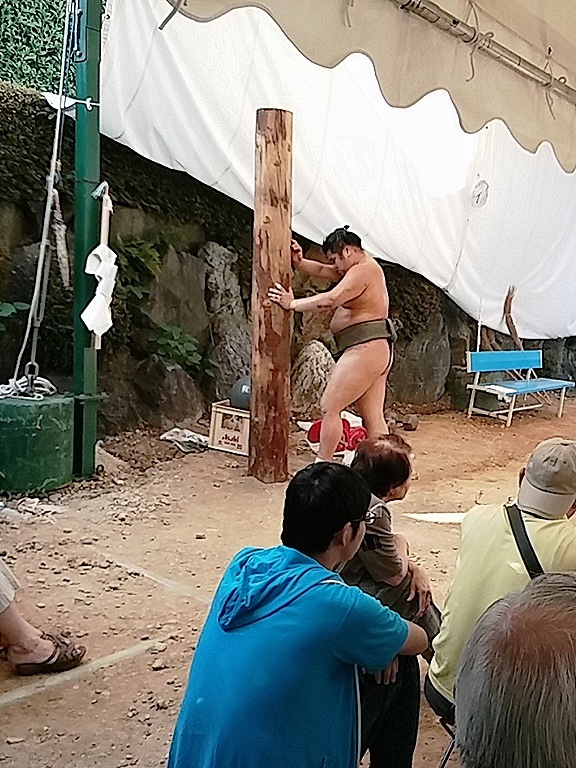 A sumo stable called Tagono-ura-beya was staying at Daiyu-in Temple during the Nagoya Grand Sumo Tournament in July. Taeko, one of my friends picked me up at 6:45 in the morning, and then we went to the temple to watch sumo wrestlers practicing outside. Four young men were training when we arrived at the temple. About 15 people had already been there and were watching their performance keenly. The number of spectators and journalists gradually increased. Most of them came with the aim of looking at Takayasu, who had a chance of winning the tournament as a Japanese and lower position wrestler. Non-Japanese wrestlers have been winning the cup for eight years, and all of the champions except for one were yokozuna (the first-rank wrestlers) or ozeki (the second-rank ones). Two of the young wresters, Sakanabe and Taka-saito began to practice. Takayasu was stretching and the second-rank wrestler, Kiseno-sato was training outside of the ring during their practice. But Wakano-sato was sitting down and staring at them. Taka-saito was throwing himself against Sakanabe again and again. Finally he was about to leave the ring, saying “Thank you.” Then Wakano-sato opened his mouth. “Do it again.” Taka-saito was stupefied and stood rooted there. He could not seem to understand what had happened for a while. Sakanabe nodded when Taka-saito looked at him. Then Taka-saito’s crash course began. He threw himself against Sakanabe and then was turned over. The same thing was done with Wakano-sato’s word, “Again.” It was repeated over and over. Taka-saito could not stand up quickly. He was panting on his knees. But Wakano-sato said, “You’re slow. Get up quickly and do it again!” Takayasu and Kiseno-sato kept on practicing without any expressions. But the other young wrestlers tensed and were doing muscle training frantically. The sense of tension hit the audience. The spectators were just looking closely to what was happening with bated breath. In the evening when I turned on the TV, Wakano-sato happened to be about to fight against his opponent. He defeated the adversary. I was happy to see he win somehow. Unfortunately, Takayasu and Kiseno-sato lost their fights…Hakuho, yokozuna, or the first-rank wrestler, from Mongolia won the tournament. But Takayasu received a fighting-spirit award. I hope the four young wrestlers, especially Taka-saito, who had a crash course, will become high-rank wrestlers and play important roles in the sumo field someday soon. The Bangladeshi Curry Class @ Aichi Summer Seminar 2014 : Will I be able to greet the summer next year? Oh, no! Hold this class next summer, too! Please! 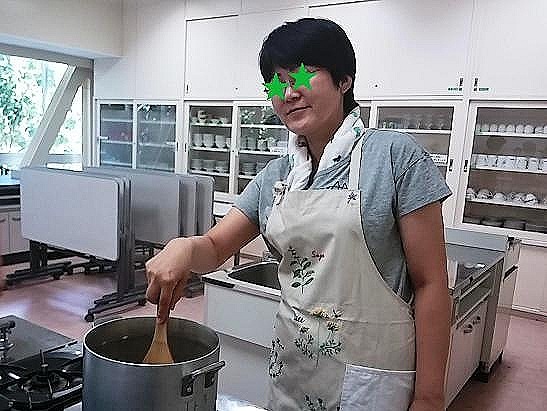 I was in the kitchen of Takakura High School of Economics Nagoya University on July 20. 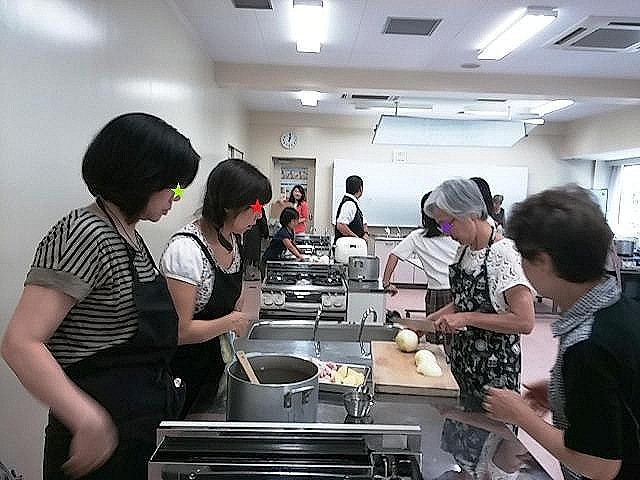 It was a cooking class of Aichi Summer Seminar, which is an annual event held by private schools in Aichi Prefecture. 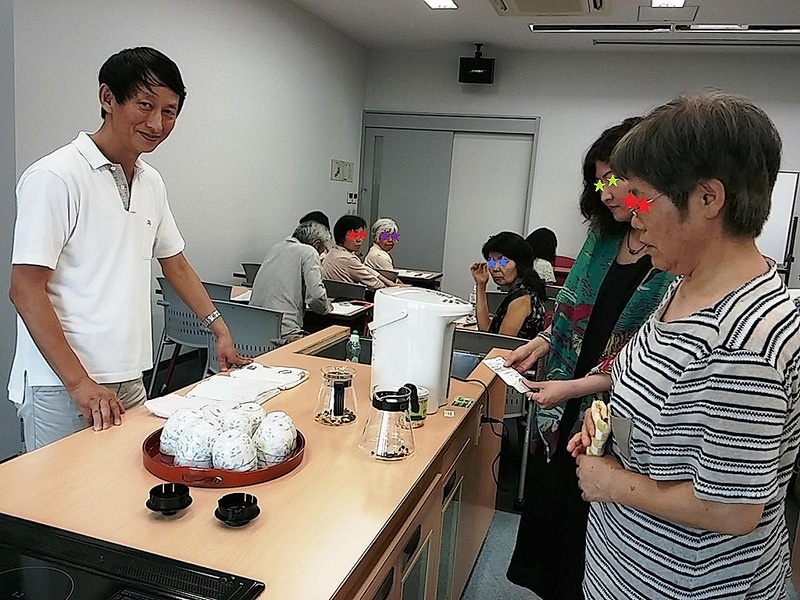 Aichi Summer Seminar is also known as “The Dream School” because anyone can become teachers and students freely. You can choose and take any classes basically for free from more than 3,000 classes. 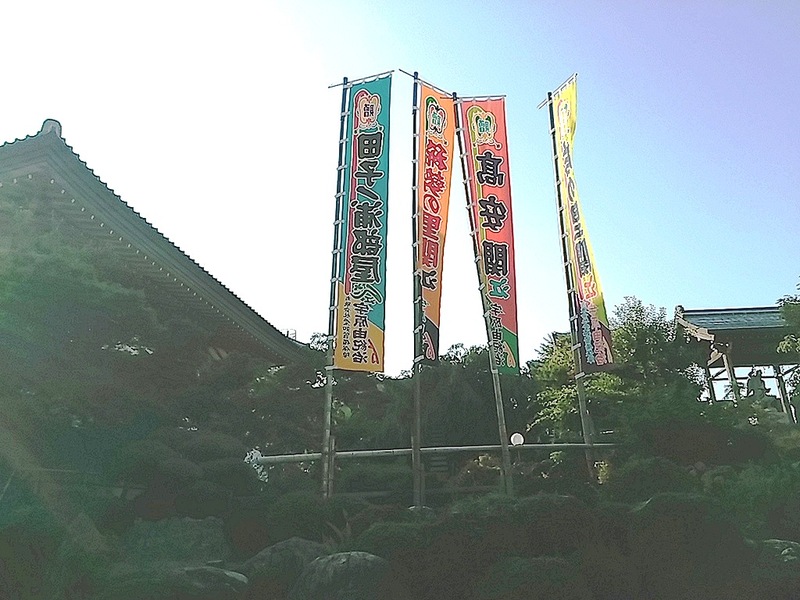 It was held at some schools near Nagoya City Museum in Mizuho-ku from July 19 to 21 this year. 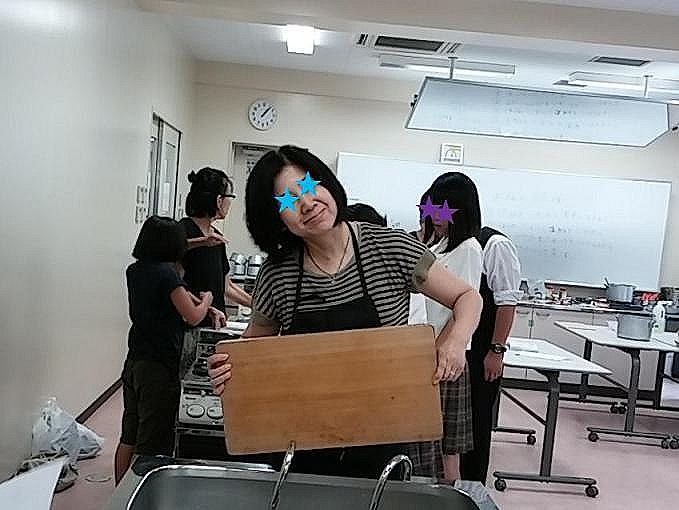 The places change every year, but I’ve joined the same cooking class for five years. 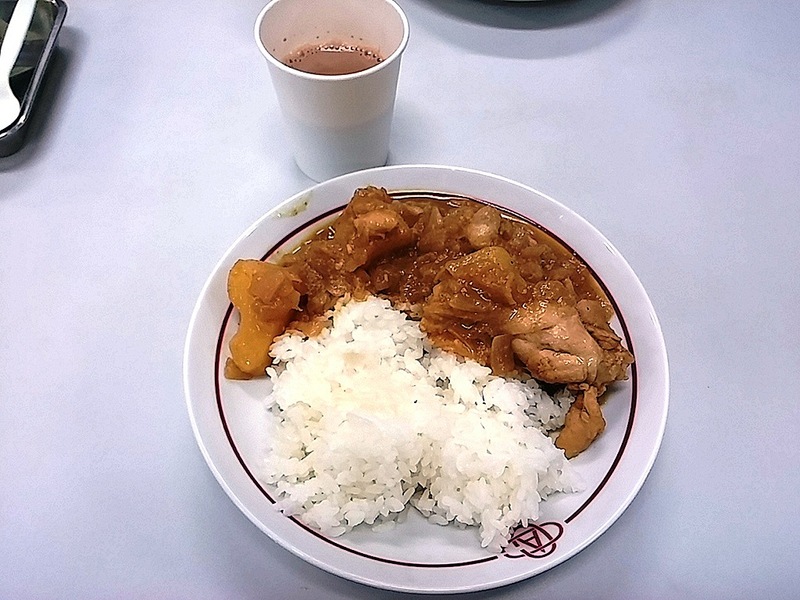 I like the Bangladeshi chicken curry in the class! 1) Rinse the chicken, chop the onions, and grind the ginger and garlic. 2) Heat oil in a pan, fry the onions until brown. 3) Add the ground ginger and garlic, curry powder and salt. 4) Pour water, cover the pan, and cook it for about 30 minutes. How easy! No.2 is the most important! You need to fry onions patiently! 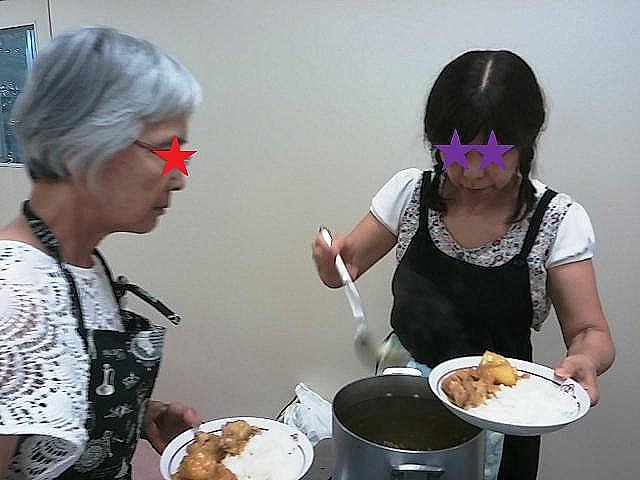 I was able to eat delicious curry and rice this year, too! Thanks! 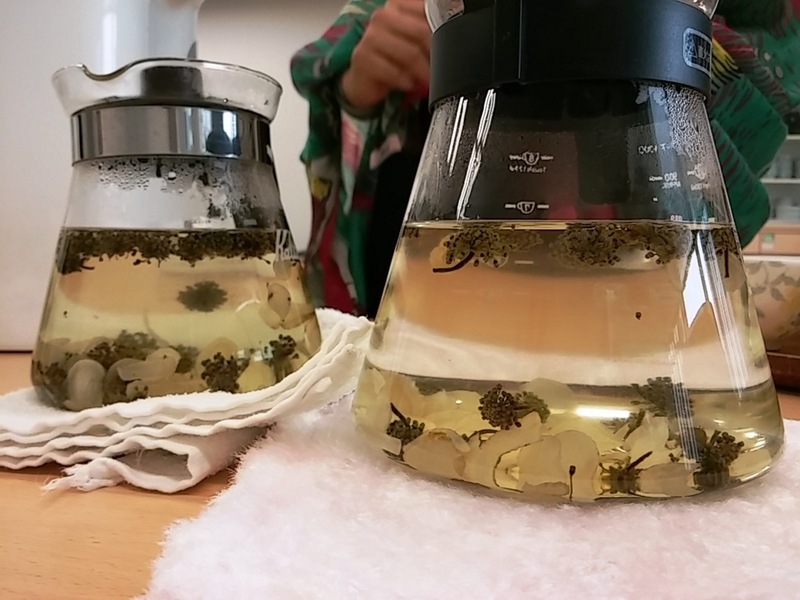 Teachers served Bangladeshi spiced tea and snacks. I had a really good time! But one of the teachers said to me, “We might not have this class any more…” What?! I really like this class! So, I asked her to have the class next year too. Summer will never arrive for me untill I take the class! Will I be able to greet the summer next year?